Neal's Yard " Power Berry "
I'm starting to dabble. I love to discover more & more about skincare natural home remedies or even store bought investments. Since I began using my Oil Cleansing Method my skin started to improve A LOT. Acne that I kept getting was starting to dwindle and then I began using Liz Earle products & started to notice that the swap in methods didn't harm my skin but helped improve the texture of my skin and my spots were keeping down to a minimum. 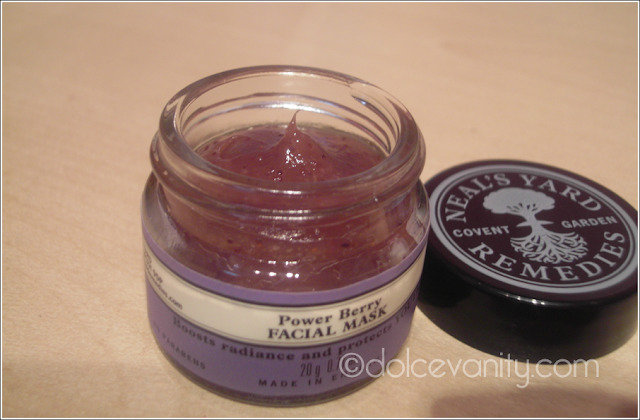 I've read a lot about Neal's Yard and decided why not give it a go, I love my Good Things facial mask that has Goji berries in the ingredients and decided to research more into the benefits. Seeing as it's great for anti ageing & boosting your skins natural glow I thought well why not try. 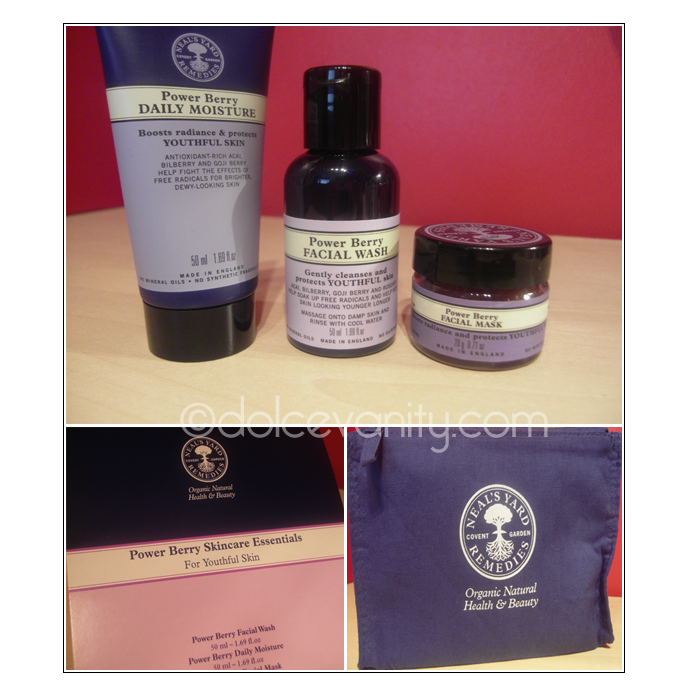 Deciding on the Power Berry trio,which includes acai, bilberry, blueberry, goji berry and cranberry to help boost the skin or exact words from the Neal's Yard website " replenish, protect and boost skin’s natural radiance. " They are small bottles as I didn't want to splash out & just in case I get a bad reaction it's money wasted. No time to waste money in this VAT raised 2011 so I decided to start off with the face mask - I am such a face mask whore. I love them, there is no more of a perfect way to relax. When I look at the face mask it reminds me of jam, it looks like it will have that very sticky hard to work with consistency, that will not feel comfortable on the skin YET I was quite amazed at how soft it was and easy to spread across the skin. It's a gel that once wet turns into a milk formation, makes it so easy to wipe off with a warm cloth afterwards . Even after the first use I was quite surprised at how nice my face felt afterwards. Even though this is a 20g jar I didn't need to take a lot out to use. It feels AMAZE on the skin it doesn't tighten or irritate so it seems good for sensitive skin . Neal's Yard says that this facial wash cleanses without stripping of nutrients & our skin's natural oils. I was not a fan of this face wash mainly because afterwards my face felt dry & tights around my eyes. Didn't like that feeling, so of course I thought I'd see what the Power Berry Daily Moisture was going to be like afterwards. It didn't make my skin feel any more drier than it previously was after using the facial wash neither was it greasy or feel heavy. Five days into this new routine, I'm breaking out. On day two it started just by my eye and now my forehead has broken out. It's not looking good so therefore I'm stopping this new skincare routine as it seems my old routine was not doing me any harm. What does it smell like I wonder?>>>>JAM?? I bought a sample of their cleanser from their store in Westfields, I hope it works! @Old Cow I really wish it was amazing for me but the timing of these breaks outs in my skin don't seem to coincide with anything else right now :o( so sad. It has a a menthol smell to it (the face mask) to my sense of smell HAHA! Gotta find the set a new home *sad. @Rhamnousia @ Desi Girl Does Makeup I hope it works for you sweetie. Like we have all learned in this beauty blogging world, what doesn't work for me isn't entirely the case for you. Would love to know how you get on with just the sample.